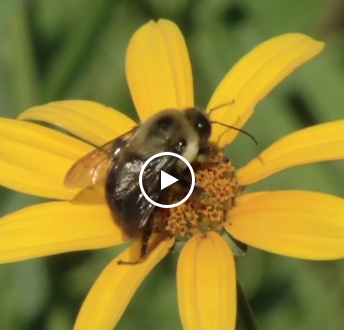 How will plant-pollinator interactions respond to climate and land cover/land use changes? Ecologists are concerned that crutial plant-pollinator relationships could be disrupted as a result of climate and land use changes, to the detriment of all (see National Academies report on this). We are using colonies of honey bees in the Mid-Atlantic region to monitor changes in the timing of this plant-pollinator interaction â€“ the honey bee nectar flow - by the simple, yet careful, daily weighing of hives to track incremental changes. Our Maryland data indicate that the peak nectar flow occurs nearly 4 weeks earlier than in 1970â€™s. This change of the nectar flow timing is likely due to climate changes and the warming effect of urbanization. Independent observations confirm that nectar sources are blooming earlier. How these changes will impact ecosystems and agriculture needs to be carefully assessed. Can modern ecosystem and climate models, based on extensive satellite observations, help us understand these changes? Satellites provide good large-scale coverage of vegetation change with respect to climate, but cannot observe pollination directly. Scale hive records tell us when nectar flows occur, and hence the peak plant-pollinator interaction. Our aim is to relate this timing and location to satellite observations and ecosystem models. We believe that using scale hives to track nectar flow is a technique that can be used to monitor changes in the plant-pollinator interaction, and that a hive monitoring network has the potential to expand on this. This timing and flow information can be linked to ecological models and satellite data that monitor vegetation parameters such as phenology. Without the primary information about the timing of nectar flows, predicting change would be extremely difficult, even with the best satellite observations and ecosystem/climate models. 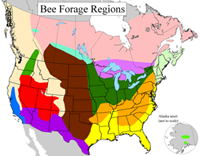 How far north will the invasive Africanized Honey Bee (AHB) establish permanent residence in North America, and how will climate change affect this? Current predictions of the spread of the AHB in the US (Harrison et al., 2006) are based primarily on winter temperature limits observed in South America. Variations in honey bee forage are missing, but may be crucial to understanding their over-wintering capability. Our hypothesis is that the predictions can be improved through the use of vegetation and surface climate information developed from satellite sensors and ecosystem models tuned with scale hive information. This builds on the successful use of satellite data to depict the areas that may be impacted by the spread of invasive plant species, such as salt cedar, or tamarisk (Morisette et al., 2006). In the Mid-Atlantic region alone, over 30 beekeepers have volunteered to collect scale hive records in order to document the current status of regional nectar flows. Beekeepers from several additional states have expressed interest in participation. There are over 100,000 beekeepers in the US, with an average distribution of 1 hive per 2 sq. km. Hives can be easily placed on scales to produce valuable and highly informative data on the timing of nectar flow. This HoneyBeeNet Web site provides a central location for the collection and sharing of nectar flow records by volunteers and provides comparisons with satellite data. We hope to better understand how climate and land use/land cover changes affect the nectar flows. We have recently forged a alliance with the National Phenology Network (NPN), who currently have several efforts underway aimed at understanding the timing of plant and animal life cycle events (phenology). With their assistance we hope our beekeepers and others can also track the phenology of plant speciesthat are important to honeybees.